Hello again my crafty pal. I bet you didn’t expect to hear from me twice in one day, but I’ve been busy in my craft room and I just had to share! 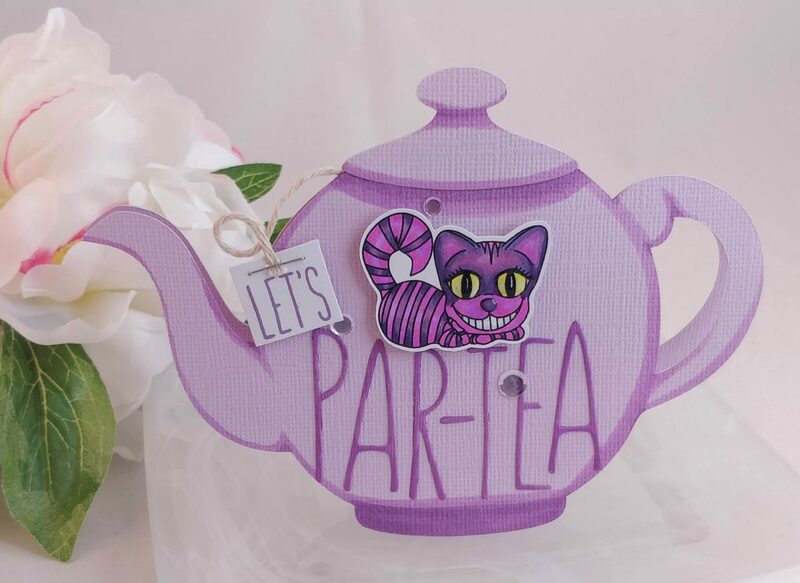 This time I’ve got a teapot shaped birthday card featuring the Cheshire Cat digi-stamp from Heartcraft Paper and a fun die cut sentiment. Isn’t it cute? 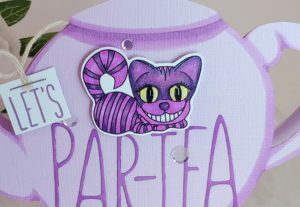 I started by printing the Cheshire Cat out onto cardstock and coloring him in with Copic markers. This is the third time I’ve used this image and each time I’ve colored him in a slightly different color scheme. Today, he’s a lot more purple than the last two times. I can’t decide which version is my favorite. Let me know down below if you like him better here, or like this, or this. Once I had him colored in, I cut him out with my ScanNCut. I also cut out a pair of teapots from purple cardstock using one of the machine’s pre-programmed image files. I sized it to 6″ wide; that will fit into a standard A2 envelope if you insert it at a slight angle. The file actually cuts the lids out separately from the pot, so I added some shadows with coordinating markers around the edges of one pot and lid, then I glued them together. I lined up the second pot behind it, and glued the second lid to that pot. (This gave me two identical pots.) I scored a line straight across, just under the lid on the second pot to form a hinge for the shaped card. Before I attached the card layers together, I decorated the front pot with the word PAR-TEA die cut from darker purple cardstock. I popped the Cheshire Cat up with a piece of foam tape. Then I stamped out the word LET’S on a scrap of white cardstock. I trimmed it down to a small square and stapled on a piece of twine to make it look like the string and label of a teabag. I glued the two pots together above the hinge line, sandwiching in the other end of twine from the teabag piece. I backed the label with a thin piece of fun foam and glued it to the edge of the card. I didn’t want it to pop up as high as the cat, but I didn’t want it flat against the card either. To finish off the card, I brushed some glitter onto the cat with my Aqua Shimmer pen and I added Diamond Glaze to his eyes and the tip of his nose. I glued on a few clear sequins to add a little more sparkle to my card. Do you like to make shaped cards? I’m a big fan; I think they can make a card feel like a special gift. Thanks for checking in with me again today. I’ll have more cardmaking fun for you soon! I love this it came out so pretty!